Non enveloped, icosahedral virion with a double capsid structure, about 70 nm in diameter. Pentameric turrets sit on the outside of the innermost capsid. The outer capsid has a T=13 icosahedral symmetry, the inner capsid a T=2* icosahedral symmetry. Segmented linear dsRNA genome. Contains 10 to 11 segments presumably coding for 11 proteins. Segments size range from 985 to 4800 bp, genome total size is about 27-30 kb (DpIRV-1). The segment 3bis is present only in the genome of virus isolated from female hymenoptera (DpIRV-1). The dsRNA genome is never completely uncoated, to prevent activation of antiviral state by the cell in response to dsRNA. The viral polymerase synthesizes a capped mRNA from each dsRNA segment. This capped mRNA is translocated to the cell cytoplasm where it is translated. Attachment to host receptors probab?y mediates endocytosis of virus into host cell. Particles are partially uncoated in endolysosomes, but not entirely, and penetrate in the cytoplasm. Early transcription of the dsRNA genome by viral polymerase occurs inside this sub-viral particle (naked core), so that dsRNA is never exposed to the cytoplasm. Full-length plus-strand transcripts from each of the dsRNA segments are synthesized. These plus-strand transcripts are used as templates for translation. Viral proteins and genomic RNAs aggregates in cytoplasmic viral factories. (+)RNAs are encapsidated in a sub-viral particle, in which they are transcribed to give RNA (-) molecules with which they become base-paired to produce dsRNA genomes. 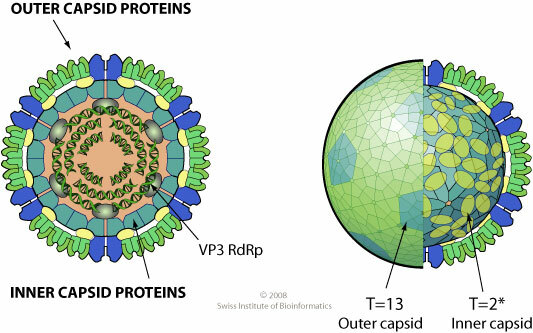 The capsid is assembled on the sub-viral particle. Mature virions are released presumably following cell death and associated breakdown of host plasma membrane.